Solid 1″ thick stair treads, never veneered. The expert woodworkers at StairSupplies™ take pride in creating the 8072 Craftsman Hand Scraped Stair Treads. 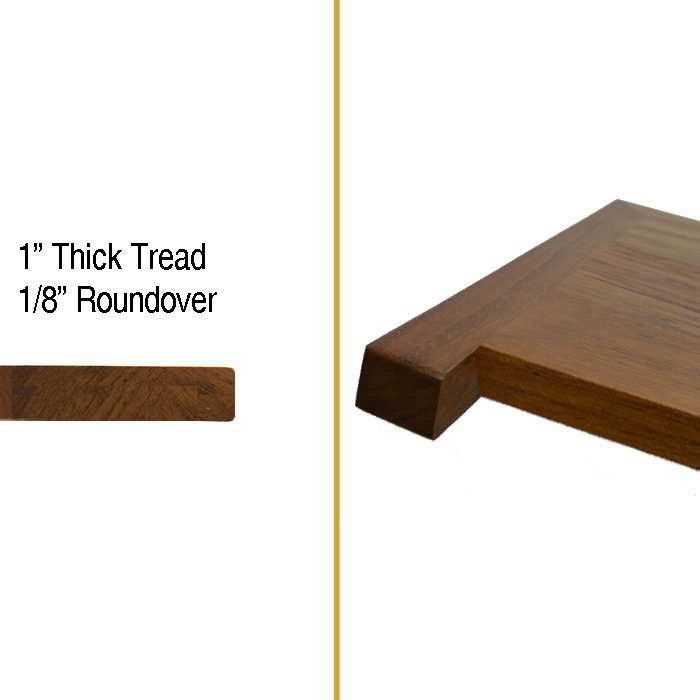 Each tread is crafted from one of our many species of stain-grade wood and detailed with a craftsman-style trim. Beautiful texture is added through the hand scraping process, resulting in a one-of-a-kind stairway. Pair the 8072 with other stair components in the craftsman style, including our Craftsman Series Box Newels and 8075 Hand Scraped Stair Risers. Any side of the 8072 Craftsman Hand Scraped Stair Treads that will not touch a wall is fitted with craftsman-style trim. Returned Edges cover end grain, while also adding decorative flair. There are three configurations of returned edges available to cover the exposed edges of 8072 Craftsman Hand Scraped Stair Treads: Left, Right, and Double. NOTE: If both sides of the stair treads fit against a wall, you do not need returned edges. 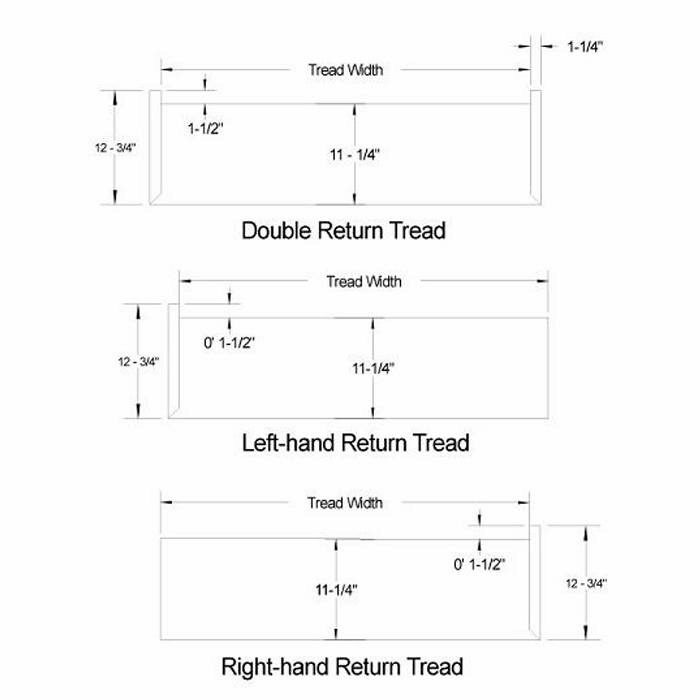 With the exception of Double Returns, all Left, Right, and No Return Treads are sent to you with up to an extra 1” of material on the end with no return. This additional allowance may be trimmed on-site to match the exact curve of your unique wall, ensuring a snug fit. Need something different? No problem! At StairSupplies™ we create custom stair tread lengths, depths, and widths every day. Use our Custom Stair Tread Designer to order the stair treads that will fit your home perfectly. At StairSupplies™ we understand that each home is different. That’s why we custom-produce all of our wood stair parts to your specifications. We don’t hold “standard” stock. We don’t offer cookie-cutter products. Rather, we take pride in giving you exactly what you want and need. So give us a call or utilize our Custom Stair Tread Designer. We can help you customize your unique treads, and address any other concerns you may have about stairway design. We are more than happy to accommodate your custom dimensions! Please use the Custom Stair Tread Designer to order treads that will fit your unique staircase. Give us a call if you have any questions! StairSupplies™ offers several premium stain and finish options for our products, depending on the product’s use. For Wood Stair Treads we offer both clear finishes and stains. Select a clear finish if you want to draw out the natural beauty and colors of the wood. If you prefer deeper, richer tones, our custom-mixed stains are the ideal choice for your Wood Stair Treads.